This is an ideal "return to sports" knee brace for post MCL and ACL injuries by Hely and Weber. It is available in anterior closure, meaning it opens from the front for easy wrap around application (left picture) or pull-up designs (pictured on the right). Can be used in mid-level sports activities. Designed for mild to moderate ACL,PCL, MCL, and LCL deficiencies. Pivot-Point Design stabilizes knee instabilities. Professional quality bilateral design for advanced knee support and protection. A superior design for knee protection in all types of sports or activities. Low profile. Geared polycentric hinges. Rigid uprights for additional medial-lateral support. Maximum knee support. Fits left or right knee. Long sleeve 3/16" thick neoprene with superior horseshoe buttress, medial and lateral hinges, Velcro straps for adjustments. Offers ligament and patellar support. Features 4-way adjustable hyperextension stops at 0° - 15° - 30° - 45° to help control range of motion. Features two wider, more stable hinges than standard knee braces. It incorporates our dual disk hinge with a floating pivot point to better accommodate the natural gliding action of the knee. The wider arms help dampen forces more efficiently. Wide bi-axial hinges provide medial/lateral ligamentous support. Neoprene hinge covers allow full sports participation. A unique design that not only normalizes patella tracking but also controls knee hyperextension. As the knee moves into extension, the buttress increases its influence to prevent patella subluxation. Provides control and support for most ligament injuries and instabilities. Polycentric adjustable hinges control flexion and extension during progressive rehabilitation. Hinged Knee Support for Medial and Lateral Instabilities. Effective for mild ACL and PCL knee injuries. Available in wrap around or sleeve versions. The flagship of BREG's hinged knee line, the Roadrunner, is a versatile intermediate brace ideal for medial and lateral instabilities of the knee as well as mild ACL or PCL instabilities. Genucentric hinge design tracks the knee's instantaneous center of motion throughout range of motion. Indications: Mild to Moderate ACL, PCL, MCL, LCL or Combined Ligament Instability, Patella Subluxation. The Hinged Knee Skin is the lightest hinge available. The Hinged Knee Skin can be worn comfortably all day long due to the seamless popliteal area and the cool, lightweight features. Suitable for mild to moderate MCL, LCL and/or ACL, PCL instabilities, this neoprene brace with extended hinge bars is an ideal for use in sporting activities. The wrap around design makes this brace ideal for those patients who have trouble applying a sleeve-style brace. Economy hinged knee brace for mild medial/lateral support of the knee. Designed to maintain warmth, provide compression and support yet allow for breathability. Hinged Knee Brace with wrap-around feature that allows for easy application. This brace provides light support to medial/lateral ligaments. 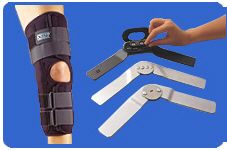 Functional hinged knee brace for mild/moderate ACL and/or PCL strains and sprains. Comes with choice of Hinges: ROM, Hinge, Heavy Hinge, or Standard Hinge. Full hinge covers allow for full sport participation. Strong, lightweight composite hinges with unique non-slip strips for a comfortable and even fit. The Protective Knee Guard provides the MCL with prophylactic protection from lateral blows common in contact sports such as football and hockey. Features flexible straps that will not bind or "dig" into skin. Dual axis hinges for medial and lateral stability. Component parts allowing full range of motion without compromising stability or support. Popliteal opening to prevent bunching and discomfort behind knee. DonJoy's Inflatable Buttress Provides support for patella malalignment, chondromalacia, and tendonitis. Coolflex, a nylon-polyester weave, maintains warmth, provides compression and support, yet allows for breathability. Same as the hinged knee but with superior and inferior buttress available. Constructed of ¼" neoprene. Supports the medial/lateral ligaments. In addition to providing mild to moderate medial/lateral support, sturdy aluminum uprights allow this brace to be used in contact sports. Superior and inferior buttress versions available. The Diamond Ultralight Knee Brace utilizes a Polyoxymethylene (POM) hinge to replace the standard steel hinges. POM is generally used in the replacement of metal gears, bushings and other mechanical parts making it an ideal replacement for the standard hinge. Indicated for medial/lateral instability, muscle/ligament weakness or injury, ACL/PCL moderate instability, strains or sprains, and degenerative joint disease where extension/flexion control is required. Features R.O.M. hinges with contoured condyle shells that allow for full flexion and extension control.